Our national relay boys up on the podium. 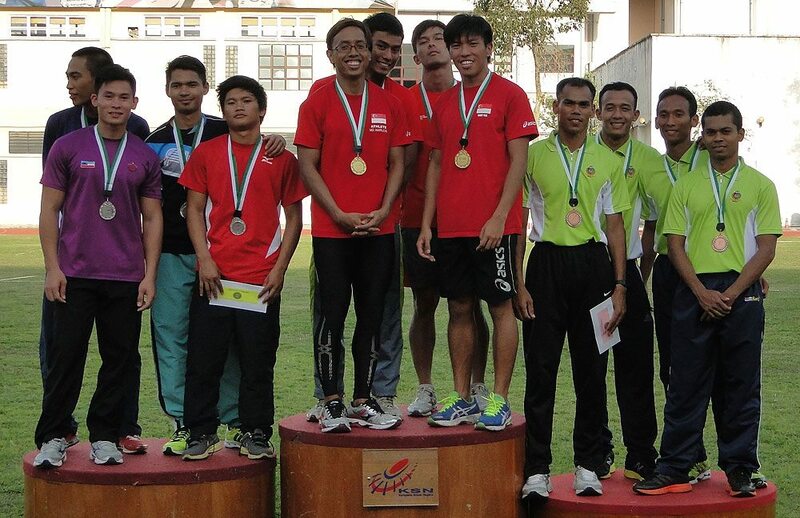 It was a fruitful trip up north as a group of Singapore athletes, 11 in total competed at the 88th edition of Malaysia Open Athletics Championships 2012 held between 6th to 7th October. Present was also 3 officials. They brought home 6 medals in total, 3 Gold, 2 Silver and 1 Bronze. The team also saw three season-best coming from three different athletes. The venue was held at the National Training Track, Bukit Jalil, Kuala lumpur. Day one saw nine of our athlete participating in five events. Three sprinters Wendy Enn, Lim Yao Peng and Md. Elfi Mustapa ran superbly to qualify for the finals in their respective events. While our throwers impressed the field, as James Wong and Wan Lay Chi each produced a medal on the first day. 43-year-old James Wong threw a season-best of 48.70 metres in the men discus throw event. The effort makes him the number one ranked Singapore thrower in his event this season. Last year SEA Games silver medalist Wan Lay Chi was in terrific form as she obliterated her competitors in the shot put women event. Her nearest competitor was 32 centimeters away from her 13.51 metres distance result. Our national relays boys running the last event on the first day of Malaysia Open didn’t disappoint either. They ran 40.30 seconds in the men 4×100 metres event, clinching gold. That timing alone is faster than last SEA Games bronze mark of 40.41 seconds. Day two we had three athletes slotted for three different events. Wan Lay Chi started the morning bagging another personal gold in the women discus throw event. Not only she walked away from the Championship with her second medal but she achieved a season-best with a throw of 47.89 metres. Based on that result, she is currently ranked number two in the SEA region this year for the event. Next up, undergraduate Soh Hua Qun added the last medal to Team Singapore 6-medal haul tally as he ran a season-best timing of 4:03.57 minutes in the men 1500 metres event. In terms of medal tally standing, Singapore was ranked number two after day one of competition, but slipped to fifth position on the final day. Unofficial results compiled by Jad Adrian.